01 July 2014, Tokyo – Chargé d’ Affaires (CDA) and Deputy Chief of Mission of the Philippine Embassy, Mr. Gilberto G.B. Asuque, (center) and Ms. Angelica Escalona (extreme left), Cultural and Information Officer, Philippine Embassy receive the Filipino students who completed their post-graduate and undergraduate degree programs under the Human Resource Development Scholarship of the Japan International Cooperation Center (JICE). The Fellows were enrolled in the International Christian University and International University of Japan. 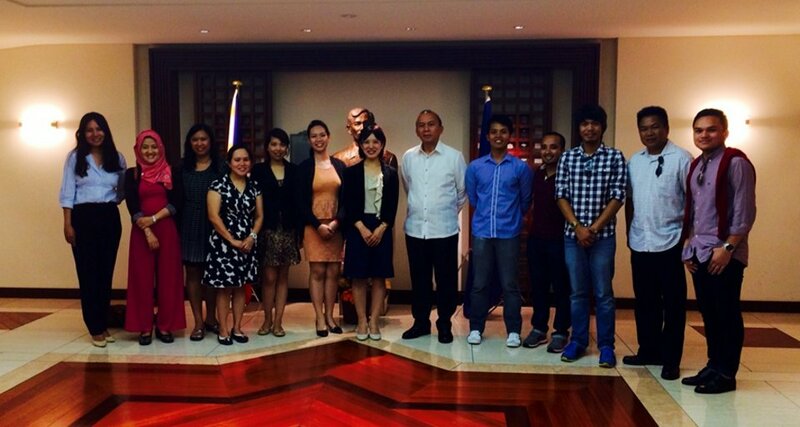 They graduated in June and will return to the Philippines to their respective government agencies in July 2014. CDA Asuque congratulated the students on the completion of their degree programs and cited the importance of strengthening the delivery of public service by their respective agencies by imparting the knowledge and skills they gained during their study in Japan. The JDS Fellows are Ms. Sheila Cabasan Edrozo of the Commission on Audit, Mr. Edward Donald Fulminar Eloja, Ms. Patricia Anne Lucion Rivera and Mr. Mark Crisostomo Pascasio of the Philippine Statistics Authority; Mr. Francis Marinas Ramirez of the Department of Budget and Management; Ms. Ada Aquino Colico of the Department of Social Welfare and Development, and Ms. Sheryl Dejarme Fortunato of the Presidential Management Staff. They were accompanied by Ms. Minori Kanesaka (beside CDA Asuque), Country Officer, International Students Division, International Students Affairs Department, JICE.